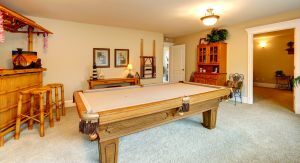 When it comes to helping keep your pool table looking and playing its best, the felt on your table plays a major role. However, over time the felt on your table can become damaged or worn, and when that happens, it can not only affect the overall aesthetic of your table, but it can also have a negative impact on any game you play as well. Refelting a pool table is a great way to help enhance the quality of your table, making your table look brand new again and ensuring that each and every one of your games are as accurate as possible. That being said, there are a number of different felt types out there, and it can be difficult to know which one is going to be the right option for your table. In an effort to help you through that decision making process, our team of San Jose pool table professionals here at The Pool Table Pros have put together this short list of helpful tips to guide you in the process of choosing new felt for your pool table. When it comes to felt, there is no right option that fits every table out there, and your choice should largely be influenced by what is going to be the right move for your table in specific. If you have a pool table in your home that only sees use on a very infrequent basis, you likely aren't going to need a top-of-the-line felt that specializes in long term durability, but if you are a serious player, that might just be the better option for you. Finding the right new felt for your pool table requires a lot of thinking about how you use your table, how frequently it's used, and what kind of aesthetic you want it to have. Regardless of what your needs might be, our team of professionals will work with you directly to ensure you are able to find the one that is going to be the perfect choice for you. Like we stated above, durability is a factor that you should have in mind when selecting a new felt for your pool table. When it comes to pool table felt, the amount of wool in the cloth is usually what determines how durable the felt is going to be. Beyond that, the durability of your felt will also be determined by the quality of its installation and the amount of time you spend playing on your table. If your table sees heavy use, or you have a table for a commercial space, it might be in your best interest to put durability above all else, but if your table sees use only more rarely when you and your family are in the mood to play a game, it might not be as important a factor. The felt on your table will have a large impact on its actual gameplay, and this is largely because the type of felt you choose is going to control the speed that the ball is able to move over your table. Your table's speed can vary greatly depending on whether you choose to go with a worsted felt or a napped woolen felt. Worsted felt is a very smooth option that will allow the balls to roll over the surface of your table with hardly any interference, but with a napped woolen felt, the noticeable nap in the cloth will provide more resistance, resulting in a slower game speed. Regardless of whether you prefer a slower game, or a faster one, our team of professionals will be able to help you find the right option based on your personal tastes. If you are looking for new felt or San Jose refelting services, then please call The Pool Table Pros at 408-499-6300 or complete our online request form.